As a premier American bluegrass band, the Steep Canyon Rangers have had the opportunity to travel to, and perform in, some of the nation’s top music cities. But for this North Carolina group, half of whose members live in Asheville and half in the neighboring community of Brevard, there’s no place like their home base. Naturally, Asheville is where the Steep Canyon Rangers prepared for their 2017 national tour with three days of performances at the nationally-renowned venue, The Orange Peel. In 2018, The Rangers are back on tour through November, continuing their collaboration with actor/banjoist/comedian Steve Martin while also adding in comedian Martin Short to shows along the way. Tour stops span the United States and Canada. ExploreAsheville.com has partnered with Steep Canyon Rangers to sponsor the band&apos;s tour bus, which will be spotted throughout the U.S. and Canada this year. The band is bluegrass to the core but continues to evolve with a fresh sound and identity all its own. And, with a passionate and energetic on-stage style, they sure know how to put on a show. The Steep Canyon Rangers feature Woody Platt (acoustic guitar), Graham Sharp (banjo), Mike Guggino (mandolin), Nicky Sanders (fiddle), Mike Ashworth (box kit/cajon) and Barrett Smith (upright bass). In early 2018, the band launched its latest album, Out in the Open, with a major performance in Asheville, the band&apos;s home base. Out in the Open, debuted at #1 on the Bluegrass Blillboard Charts. The Steep Canyon Rangers played a song off of the new album during a performance on the Tonight Show with Jimmy Fallon on May 3, 2018 -- the band&apos;s debut solo late night performance. The Steep Canyon Rangers have been pickin’ and strummin’ on tour for audiences for years but the band traces its humble beginnings back to North Carolina. Nearly all of the band’s six members are originally from North Carolina. Three of them grew up in Brevard, just 30 miles south of Asheville. They grew up with the musical influences of the area, which are steeped in the traditions of bluegrass and old time mountain music. Those traditions trace back to the Anglo-Celtic settlers of western North Carolina who had mastered the craft of telling stories through song. 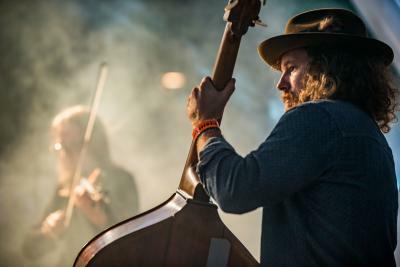 As a band, The Steep Canyon Rangers took shape in 2000 when Woody Platt, Graham Sharp and Charles R. Humphrey III (original bassist) were students at the University of North Carolina playing together in area bars. By 2006, the group had gained momentum and was named the International Bluegrass Music Association Emerging Artist of the Year. It was in 2013 the Steep Canyon Rangers reached a pinnacle in their career, earning the Grammy Award for Best Bluegrass Album. The Steep Canyon Rangers now have recorded a total of 10 studio albums. Two of those albums were recorded at Asheville’s nationally-recognized Echo Mountain Recording Studios. The albums have included many local references including a song titled “Looking Glass,” an ode to a favorite waterfall in the nearby community of Brevard. "We have a couple of world-class recording studios where Nashville artists are now coming here to record, instead of making their music on Music Row," Graham Sharp told Axs. "Big bands from all over the country are making records in Asheville now, which is great." Echo Mountain Recording Studios is also where the band collaborated with the Asheville Symphony Orchestra (ASO) for the Asheville Symphony Sessions album, which brings music from Western North Carolina’s most-beloved musicians together with the orchestra ensemble. “We have had the opportunity to share the stage with several orchestras around the country, so being invited to work with the ASO right here at home was fantastic,” band member Woody Platt said. The band says it&apos;s been exciting to watch Asheville develop into a top music destination and to be a part of growth. "Asheville has some of the best places in the country to see live music," Graham Sharp told Axs. "It&apos;s really grown to where big national acts come through Asheville and love playing here." As they tour, they seek to bring the Western North Carolina bluegrass sound to audiences all over the country. Steep Canyon Rangers photos by David Simchock. Fresh sounds from local artists.